With a stay at AAAA Hotelwelt Kübler in Karlsruhe (Innenstadt-West), you'll be within a 10-minute drive of Messe Karlsruhe and Basic Rights Square (Platz der Grundrechte). This hotel is 0.5 mi (0.9 km) from Prince Max Palace and 0.6 mi (1 km) from Marketplace Square. Retreat to Leonardo Hotel Karlsruhe and discover a modern hotel in the heart of Karlsruhe. Enjoy the hotel’s prime location within walking distance of the Stadtgarten and Opera House, and take advantage of the hotel’s amenities. Guests can dine on freshly prepared dishes in the restaurant, drop by the cosy bar for a drink or relax outside in the beer garden. Rooms are designed in a contemporary style, equipped with free Wi-Fi, HD TV and en suite bathroom stocked with Sea of Spa products. Make yourself at home in one of the 134 air-conditioned rooms featuring refrigerators and LED televisions. Complimentary wireless Internet access keeps you connected, and cable programming is available for your entertainment. Bathrooms have showers and hair dryers. Conveniences include phones, as well as safes and desks. Make yourself at home in one of the 139 air-conditioned rooms featuring iPod docking stations. Complimentary wireless Internet access keeps you connected, and satellite programming is available for your entertainment. Bathrooms have showers and hair dryers. Conveniences include phones and desks, and housekeeping is provided daily. Make yourself at home in one of the 52 air-conditioned rooms featuring minibars and flat-screen televisions. Complimentary wireless Internet access keeps you connected, and cable programming is available for your entertainment. Conveniences include desks, and housekeeping is provided daily. 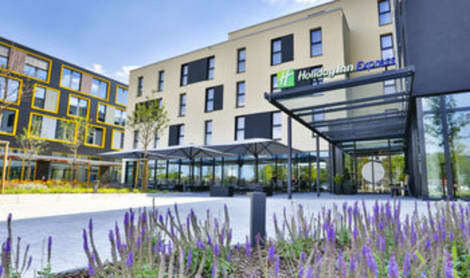 A convenient hotel near Karlsruhe city centre, with breakfast includedHoliday Inn Express® Karlsruhe - City Park hotel is a 15-minute walk or a short tram ride from the city centre.Nearby Karlsruhe HBF station is served by direct trains to Basel and Munich, while the easily accessible A5 and A8 motorways provide connections to Frankfurt and Stuttgart. Karlsruhe/Baden-Baden Airport (FKB) is a 30-minute drive from the hotel. We’re steps from City Park, and a short drive takes you to the baroque, 18th-century Karlsruhe Palace, offering museums and a botanical garden surrounded by woodland in the heart of the city. Nearby, the Kaiserstrasse shopping boulevard has brand-name stores, bars and cafés. For a day out with kids, the Zoologischer Stadtgarten, a 20-minute stroll away, is home to chimpanzees and snow leopards. Business guests are close to the Karlsruhe Convention Centre and can host events in the hotel's 3 flexible conference rooms which accommodate up to 80 people.At this hotel you can enjoy:- Inclusive Wi-Fi- Onsite parking for a daily fee- Next Generation bedrooms with Smart TVs- Sofa beds for familiesSet yourself up for the day with the inclusive Express Start™ Breakfast buffet in the lobby bar, which also offers coffee, drinks and an all-day menu of tasty hot and cold snacks. lastminute.com has a fantastic range of hotels in Karlsruhe, with everything from cheap hotels to luxurious five star accommodation available. We like to live up to our last minute name so remember you can book any one of our excellent Karlsruhe hotels up until midnight and stay the same night.